L I V I A: [NEW FASHIONABLE DESIGNS FEATURING U BY KOTEX DESIGNER SERIES] + SketchSHE COLLABORATES WITH U BY KOTEX! 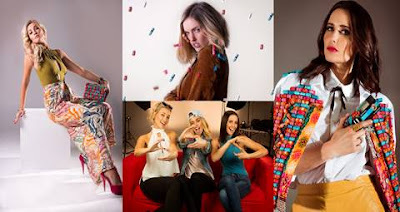 [NEW FASHIONABLE DESIGNS FEATURING U BY KOTEX DESIGNER SERIES] + SketchSHE COLLABORATES WITH U BY KOTEX! U by Kotex have collaborated with SketchSHE which really takes the seriousness out of "periods" and presents it in a way where sanitary pads can be a fun product! Let's not forget what Amy Schumer's response to "What are you wearing?" on the red carpet was. She quotes, "I'm wearing Vivienne Westwood, Tom Ford shoes..and an O.B tampon!" These days...it's all about being open and honest right? (Plus having that relaxed vibe is so much better than a serious one). And if you guys check out the Youtube video below, you'll notice it's SketchSHE in collaboration with U by Kotex where they are encapsulating the new launch of "it's sah fashion". But I am not going to reveal too much about the video because it's more of a fun 'mockumentary' type of video that we all can relate to and even make a guess as to who they are mocking (in a fun way). Furthermore, you'll also notice the fashionable and funky new packaging of U by Kotex in the video (from the pads to the tampons) which are all vibrant and fresh looking. Simply, the video tells us that we shouldn't all take ourselves too seriously, especially when it comes to fashion. It's all about being fun at the same time which is the perfect combination for fashion. The U by Kotex new packaging (also known as the Designer series) features various patterns which are all quite funky looking and where they have been highly inspired by a global "Rustic Glam" trend. Personally, I feel that they definitely jazz things up when it comes to that time of the month and where you can potentially enjoy "putting on a pad or tampon" because of how vibrant the packaging are. For once, the sanitary pads don't have to be a solid white colour (the usual plain white packaging) because now with U by Kotex's new Designer Series, you can comfortably hold the packaging in disguise on your trip to the bathroom. They feature bold and geometric designs which look so attractive. For a full run-down of what's NEW within U by Kotex's Designer Series be sure to scroll down to get the latest update. The U by Kotex Designer series are now available nationally from supermarkets and mass merchants. These are super adorable and come with printed designs. This range features a mix of animal print, rustic geometrics and bold colours which make it seriously colourful and vibrant. These come in Ultrathins which is perfect for a 'regular' type of flow. Some features include a rapid dry-core, which means that it draws away moisture so that it leaves the area dry. The Ultrathins also come with secure wings which will ensure that your pad will hold its place. These liners come in a pack of 30 and feature fun coloured designs on the actual product. It's definitely a great back-up when it comes to that time of the month. They're super breathable and are so ideal for the handbag! I'll always keep a pack of these liners in my bag for those just in case moments. These regular sized slim tampons come with a re-sealable zip-close pouch to prevent any embarrassing moments. (Yes...you girls know what I'm talking about...) It all comes down to the detailing of the packaging, so the U by Kotex Designer Series have definitely hit the on point scale for its new product packaging. They're definitely a great handbag essential because of how conveniently packed they are. Overall, the U by Kotex Designer Series is definitely a funky and stylish range. What better way to rock sanitary pads and tampons in the most fashionable way right? Embrace designs and remember that when it comes to having your period, it can be fun and fashionable. What are your thoughts on the new Designer Series by U by Kotex? Thank you U by Kotex for supporting me for this review. My reviews are based on my personal and true experiences. I only recommend products that I truly support.